The festival of Jivitputrika Vrat commemorates the extreme and never-ending love and affection of a mother towards her children. On this occasion, the mothers keep a very strict fast for the well-being of her children. Jivitputrika Fast should be observed without even drinking a drop of water. If this fast is done with water it is called as Khur Jitiya. It is a three-day celebration initiating from the seventh day to the ninth day of Ashwin month during Krishna Paksha. The primary day which is the day preceding to the festival is called as Nahai-Khai. On this particular day, the mothers consume food as a source of nourishment after taking a shower. On the second day, mothers observe a strict Jivitputrika fast. On third day of the occasion, the fast closures with Paaran (consuming the main nourishment). This festival is primarily observed in the regions of Uttar Pradesh, Jharkhand, and Bihar and it is also well-known in Nepal. As per the legend, there lived a kind-hearted and wise King named Jimutavahana. The King was not happy with the various worldly pleasures and therefore he gave the Kingdom and its respective responsibilities to his brothers, after that he took his way to a forest. After some time, while walking in the forest, the King found an old lady who was crying. When he asked her, the King got to know that the lady belongs to Nagvanshi (snake family) and had one son only. But due to the oath that they had taken, there was a ritual to offer a snake every day to Pakshiraj Garuda as his feed and today was the chance of her son. Seeing the plight of the woman, Jimutavahana promised her that he would protect his son and his life from Garuda. He then laid down on the rocks by covering himself in a red colored cloth and presented himself as the feed for Garuda. 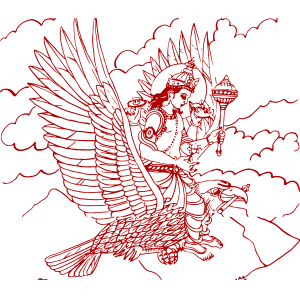 When Garuda appeared, he held Jimutavahana. While having its feed, he saw that there are no tears or fear of death in his eyes. Garuda found it surprising and asked his real identity. While listening to the entire thing, Pakshiraj Garuda left Jimutavahana free as he was pleased with his bravery and also gave a promise to not take any more sacrifices and offerings from snakes. Thus, because of the generosity and bravery of the King, the lives of snakes were saved. Therefore, the day is celebrated as Jivitputrika Vrat where the mothers keep a fast for the wellbeing, good fortune and longevity of their children. The Jivitputrika fast is celebrated with much enthusiasm and joy. For the longevity and good fortune of the children, the mothers observe this fast most religiously. Women who observe a strict Jivitputrika Fast should get up early in the morning before sunrise and take a holy bath and have the sacred food. After that, they abstain themselves from consuming food and drinking water for the whole day. On the very next morning, during the time when Ashtami Tithi ends, women can conclude their fast.